It was news that broke the heart of a nation. Or at least one eager-to-impress fashion designer. 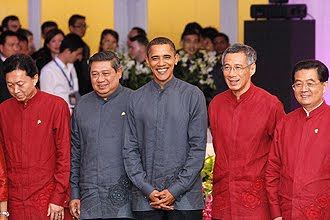 When it was announced during the Asia-Pacific Economic Cooperation (Apec) forum that US President Barack Obama wouldn’t make it to Singapore in time to don Singaporean Song Wykidd’s Peranakan-inspired design for the group photo, the Lion City’s shoulders sagged in collective disappointment. 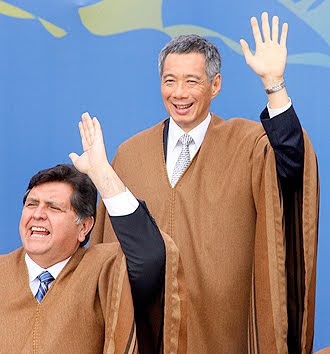 Remember the photo of the Apec leaders in those wacky ponchos in Peru last year? Apart from a sombrero, the only thing missing was a little donkey by their side. Those ponchos provided much needed comic relief during those dark days in 2008 when it seemed like we were heading into the Worst Depression Ever. So was it really necessary to abandon the costumed photo shoot and deprive us of this year’s “poncho” moment just because of the tardiness of one guy? Well, yah, if that guy is Mr Obama. Otherwise, it would be like a Destiny’s Child reunion without Beyonce. No, no, no, no, no. Notice how Mr Song didn’t seem to care how his design might look like on the leaders of the other 20 Apec member countries. Starstruck much? If Mr Obama couldn’t make it, the photo shoot would be pushed back to a day later when everyone would be in their boring business suits. 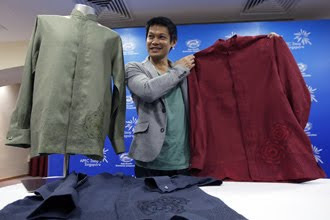 Two months of painstakingly hand-embroidering the flower motif with its 21 petals representing the 21 Apec economies on the attire designed by Mr Song and the Apec leaders were going to wear freakin’ business suits for the photo shoot? Why even bother? Mr Song must have been crushed. But he stoically told The Business Times that Apec leaders wearing his design for the photo shoot “was not important from a creative perspective”. Yah, right, that was his main concern – the “creative perspective”. Denial is not just a river in Egypt. Blame it on Nidal Malik Hasan, who killed 13 people and wounded many others at Fort Hood in the worst shooring tragedy on a US military base. Mr Obama’s trip to Singapore was delayed because he had to attend the memorial service for the victims. So it wasn't like his dog Bo ate his homework. But he must have known about the hearts he was breaking in Singapore or maybe he was just really into Peranakan culture after catching Little Nyonya on DVD because last Saturday night, Mr Obama and his entourage reportedly “rushed” to the Esplanade after landing at Paya Lebar Airbase and made it in time to put on Mr Song’s design for the photo shoot we thought wouldn't happen. We got our “poncho” moment. Hallelujah! And one fashion designer must be mighty relieved – even from a “creative perspective”.